Expanded coverage of Marshall University sports from Gazette staff writer and columnist Doug Smock. They have been given summons over an incident outside a 4th Avenue bar following the Memphis game. Statement forthcoming from Mike Hamrick and Coach Herrion, but I am told the two will play Wednesday night. Without declaring guilt or innocence, I must say I’ve seen too much of this in my 9 years on the Herd beat. It gets old, old, old. I’ve seen bad starts to the preseason, but this one may top all. On second thought, it might not … Albert McClellan and Doug Legursky getting injured while I was at the State Am in 2007 is about the worst. Then again, McClellan and Legursky were upstanding citizens as well as football players. The 3 freshmen who were dismissed were not, apparently. 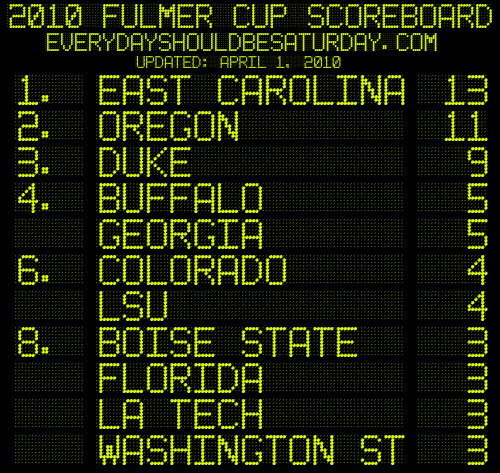 The folks who track the Fulmer Cup had much fun with this. I don’t know this to be true, and will not look, but I hear some misguided fan announced on a board (not herdfans, it appears) that Antwon Chisholm attended the second pratice. Uh, not quite … though that No. 7 was Travon Van, answering one of the burning questions of the offseason. Doc tells me there are no Clearinghouse issues that have thoroughly annoyed us in recent years. * Plays of the day: Rashad Jackson (we’re jokingly calling him Bradshaw; he wears 44) and Mario Harvey with big picks of Brian Anderson and A.J. Graham (hope I kept that order straight). * QB derby: Nothing conclusive to report here. Willy Korn does look like he’s been there before. It was kind of tough throwing to receivers whose heads were spinning, but he looks fine. Eddie Sullivan’s throwing motion might stand some tinkering, but he can throw the rock. … B.A. is vulnerable, as if we didn’t know (see players of the day). Stay tuned. * Kicker derby: We’ll have to wait until Justin Haig and George Brody get accustomed to kicking sans tee off the Edwards Stadium turf. * Injuries: Kevin Perry was riding Jacob’s Ladder in the morning … Jermaine Kelson tweaked a hammy but worked it out. As coach points out in my story, freshmen must learn EVERYTHING, and keeping out of hamstring pulls is one part. I’ll be at morning (veterans) practice the next three days, back in Charleston in the evening. This is before the arrest of Marshall’s starting cornerbacks. Note who is leading the pack. Good Fulmer Cup points there. And speaking of that, here is the latest in that prestigious contest.